The New Horizons Care Center operates in the town of Zahrani in southern Lebanon. The families we work with live in primitive tents constructed of plastic, iron, and wood. With only limited access to basics, they often have no water, proper washing facilities, or electricity. Very few of the people we serve have had any formal education, and many are illiterate. To meet these needs, we have developed a literacy and basic education program for children and vocational training for women in the community. A jewelry-making project helps women earn a small income that will benefit their families. 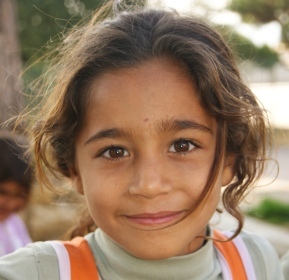 At New Horizons, we work with 25 children, between the ages of 5-12, from very poor Gypsy and Bedouin communities. Many of the children in the program have never attended school. Kids Alive offers them a basic education – primarily Arabic, English, and math – as well as nutritious snack, sports, and devotions. The center is operated alongside two partner organizations who help provide medical care to people in the community and vocational skills to older girls. We are thankful to be able to come alongside these refugees and offer education, job training, nutrition, health care, and assistance with developing micro-enterprise activities. But the foundation of the programs is our desire to share the love of Christ with children and families, encouraging them to come to know Him in their own lives. Support the Ministry of New Horizons Care Center with Your Gift Today.